Component X-Data – Displays and allows editing of CADWorx Data automatically on a particular component with no need to open a separate dialog. ISO (Isometric ) Mark System – Provides repeatability for Isometrics and Mark Numbers. The MTOWorx Palette focuses on the CADWorx Plant Bill of Materials and provides increased and immediate access to all of the data in the model and its’ External References (x-refs). Model BOM: The Model BOM tab focuses on the Model Bill of Material inclusive of Plant or Steel data. The data is presented instantaneously to the user in one of two different grid formats; as a single Bill of Material (BOM) or as a Material Take-Off (MTO). The BOM Grid displays every CADWorx component in the current model and attached xrefs in its own individual row while the MTO Grid will display all “like” components and roll them up into a single row. A Total or Cut List MTO is available with the click of a button. The MTOWorx Grid Manager provides the user complete control over what the grid will display. Ancillary functions also exist on the palette to facilitate data changes, data viewing, exporting data to Excel and the comparison of data. Component X-Data: The Component X-Data tab allows the user to view and in some cases edit, the CADWorx Component data. Enable the system, select an object and quickly view and/or modify data as needed. Multiple objects may be selected to perform Global Editing. Isometric Mark System: During isometric production, ISOGEN® automatically puts a unique mark number in for every item(s) on the Bill of Material and uses that as the call out in the Isometric. If changes are made to the 3D Model and the isometrics are re-run, the mark numbers will change. MTOWorx automatic mark control takes the guesswork out of mark numbers by letting the user assign the mark numbers. The Model BOM Tab’s main function is to allow the user to view the BOM or MTO for the current model instantaneously. The user has the option to view either the overall Piping BOM or the overall Steel BOM. There are 40 customizable Grid configurations for Piping and 40 customizable Grid configurations for Steel in which the user can define which fields they want to see in each grid. In addition, the user has the ability to save a custom “grid applied” column filter for each custom grid. There is also an Overall Filter to limit the items displayed to specific lines or models. Finally, there are toolbox options which offer the following grid options: Include Existing Components, Include Erection Components, Include Miscellaneous Components, Include Offshore Components, Include Start and Stop Signs, Exclude Welds and Exclude Fabrication Items. Each user’s grid settings can easily be imported/exported which allows multiple users to share a standard Grid Setup. BOM Type: Press the Piping or Steel button to select the type of components to gather in the BOM grid. The button will turn green to indicate which BOM Type is currently selected. After selection, the BOM grid will automatically refresh with the information contained in the current drawing. When Piping is selected, there are three options for the grid: Single, Total, and Cut. Steel only has Single and Cut. If Single is selected, the grid will populate with the each component in the model. If Total is selected, the total length of pipe will be displayed in the Quantity Field. If Cut is selected, the total quantity of pipe will be displayed in the Quantity Field. 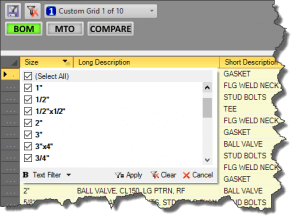 Grid Manager: The Grid Manager allows the user to configure and save 40 different custom grids for both Piping and Steel. The user can select the fields they would like to save in each grid, enter custom field headers, and even add User Fields to the Grid. 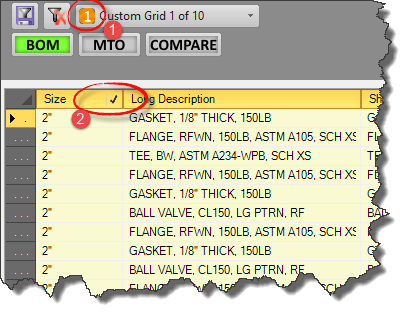 The Grid Manager can be found in the MTOWorx branch in the Worx Settings Menu. Piping and Steel have their own individual manager where you can modify and set up the custom grids. Step 1: Choose the Pipe or Steel Grid Manager from the MTOWorx branch in the Worx Settings Menu. Step 2: Choose the “Custom Grid” using the drop-down on the ribbon. Step 3: Click on an “Available Field” and use the left and right arrow buttons to move the fields into the “Selected Fields” list box. Step 4: Once the required fields are selected, use the up and down arrow buttons to move the fields into the required order. Step 5: User Fields are constants that can be placed into the grid. Set the User Field Values using the text box entries. 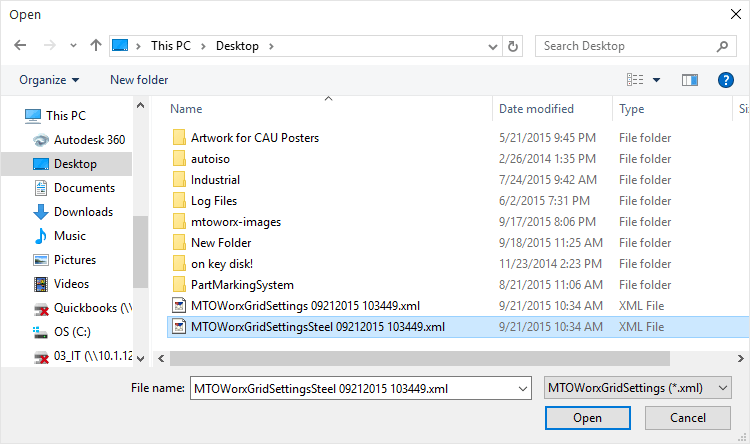 The Grid Manager Column Headers for each allowed grid field can be set up on the “Pipe Table Headers” or “Steel Table Headers” screen by selecting the respective item from the MTOWorx Steup Menu. Once on the screen, just type in the desired header as shown below. The Column Headers are global across all of the saved grids. Step 1A: Click the “Piping Table Headers” button for the Piping Headers. Step 1B: Click the “Steel Table Headers button for the Steel Headers. Step 2: Type the desired header into each Column Header Field. Leave the field empty to keep the Column Header default. Step 3: Once the Column Headers are configured, save the configuration. Grid configurations can be Exported and Imported from the Grid Manager. This functionality allows grids to be project specific as well as to be shared between multiple CADWorx Workstations. where MM=Month, DD=Day, YYYY=year, HH=Hour, mm=Minutes, ss=Seconds. 2. To Import the Grid Configuration for either Piping or Steel, press the “Import Grids” button. The user will be prompted with the “Open Dialog”. The dialog is specifically looking for and will only list files starting with “MTOWorxGridSettings”. Choose either the Piping or Steel file desired and press the “Open” button to import. Component Types – Filters out CADWorx Components from the Grid such as Welds, Start Signs and Stop Signs or entire component groups like All Existing Components. Drawing Names – Filters out the Grid so it only displays specific Drawings. Line Numbers – Filters out the Grid so it only displays specific Line Numbers. Grid Level Filtering provides Excel Type Filtering inside the MTOWorx Palette Grid. 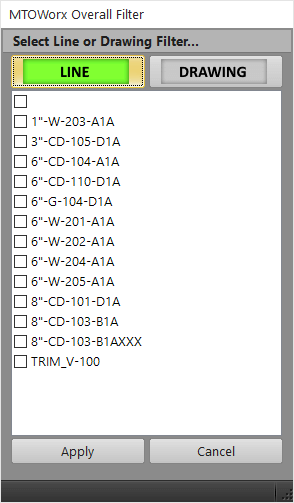 Component Types: The Component Types are filtered by selecting the Bill of Materials in the MTOWorx branch from the settings menu. The Bill of Material (BOM) and Material Take Off (MTO) Grids are controlled by an Overall Filter. For piping, the Overall Filter is based on Line Number or Drawing Name. For steel, the Overall Filter is based on Drawing Name. Enabling the Overall Filter limits the components listed in the BOM and MTO Grids to components containing that information. The following is a screen shot of the Overall Filter dialog. In this case, the user would select the line number(s) to be included in the BOM and MTO grid and press “Apply”. If a drawing filter is desired then the user can click on the “Drawing” button and select the drawing(s) to be included in the BOM and MTO grid. Each Column in the grid has its own Drop Down Filter exactly like the AutoFilter Functionality inside of Excel. The user can filter the BOM and MTO Grids in any number of ways to filter out exactly what is required for the particular job. For example, if the user only wants to see 2″ components, they will first drop down the size filter, clear all the items except for 2″ and then press “Apply”. Column Filters can be saved within a Custom Grid Position; this allows the user to have even more grid and model management. Below is a filtered grid that was saved as a Custom Grid. The first thing to notice is that the icon next to the Custom Grid Position Name 1 is Orange as opposed to the standard Blue. This indicates that a Filtered Grid is saved in the Custom Grid. The next item to notice is the “✔” above the column. This indicates the column is filtered. More than one column can be filtered so it is important to watch for the “✔”. Save Column Filters – Saves the current column filters within the Current Custom Grid Position. Note: The BOM Grids and the MTO Grids are separate. The buttons function for the currently displayed Grid. Clear Column Filters: This will clear all of the column filters and save the Grid to the Custom Grid Position without filters. To remove a column filter without saving to the Custom Grid Position use the Column Filter Dropdown in the grid and press the “Clear” button. Find: Select a row(s) in the BOM Grid and press the “Find” button. The drawing window will zoom to the selected components(s) whether it is in the current model or an X-ref. Select: Select a row(s) in the BOM Grid and press the “Select” button. All of the components chosen in the Grid will be selected in Model Space. Just like “Find,” this works with components in the current model or an X-ref. Excel Export: Export the complete Grid Listing to Excel (xlsx format). Quick Report: Pressing the “Quick Report” button will bring up the dialog below. The Quick Report allows the user to export the BOM Grid contents to a predefined Excel Template in xlsx or xlsm format. The template can contain a custom column header & images as well as a predefined AutoFilter. Step 1: Ensure the Template Directory is correctly specified. 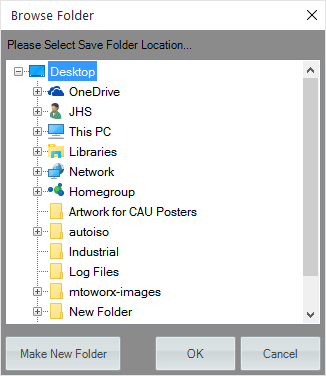 If not then press the Folder Icon to choose a directory. Step 2: Ensure the Output Directory is correctly specified. If not then press the Folder Icon to choose a directory. Step 3: Select a Template from the drop-down. This contains all of the templates in the selected Template Directory. If you move a new template into the Template Directory using Windows Explorer while the dialog is open then press the “Refresh” button. Step 4: Select a “Start Row”. This is the row where the data will start. Usually, this is the row below the Header Row in the selected template. 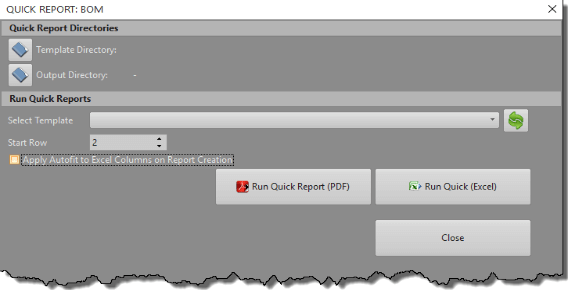 Step 5: Run the Quick Report as a PDF or Excel Output. If you would like the Columns to AutoFit in the template then click the check box. The report will be automatically opened in Excel or Adobe Reader/Acrobat. Additional Functionality: The additional functionalities provide the user with the ability to check, find and replace component information using an Excel Spreadsheet. The user also has the capability to compare a previous BOM against the current model to view all BOM Additions and BOM Deletions. Furthermore the user can create a full nozzle schedule report with the click of a button. Compare: This feature allows the user to compare the components in the current model with a previously exported BOM. Once compared, the user will have a complete overview of all the BOM Additions and BOM Deletions. The ‘Compared’ BOM can also be exported to an Excel Spreadsheet. By selecting the “Compare” the user will be prompted with the “Open Dialog” window. Simply select the desired BOM and click OPEN. The BOM Additions and the BOM Deletions tables will then be populated. The current model components will be shown in the BOM Additions table and the Excel file that was selected to compare will be shown in the BOM Deletions table. The Nozzle Schedule button produces a Nozzle Schedule in Excel Format for all of the Equipment in the current drawing. Each piece of Equipment is listed in its own Excel Sheet as shown below. Note: This must be run in the Equipment Model as it does not currently take into account X-Refs like most functions in MTOWorx. Replace Part Number on Long Description Match: This allows the user to Update Part Numbers (DBCODES) in the current Model based on an Excel Spreadsheet of parts. A Match on Long Description will update the Part Number. Replace Part Number on Long Description and Size Match: This allows the user to Update Part Numbers (DBCODES) in the current Model based on an Excel Spreadsheet of parts. A Match on Long Description and Size will update the Part Number. The Component X-Data Tab is a properties palette for CADWorx Data. Instead of opening the C-Edit Dialog, the user is able to select a component and edit its data directly in the Palette. Multiple Components can also be edited at the same time. After selecting a component in the Model, the Component X-Data Palette will display the information held in the CADWorx Component.